That notion is the book. 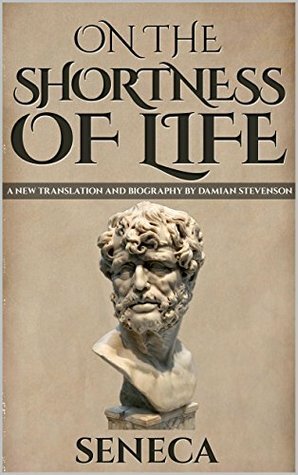 You surely used different ways to rephrase the essence of your thoughts, Seneca, which are mainly intended to point out that despite our whiny attitude, we have time. The problem is that we don’t use it wisely. I can’t say I didn’t feel slightly guilty while reading those words, as I remembered all the times I just stayed here, lying down on a couch looking at the ceiling, planning things I was never going to say or do or cook or fix. If I express that point of view using those exact words, it might sound like life going to waste. But what if I say “I stayed at home wistfully looking at the whitness of my wall, savoring my fictitious freedom, questioning my own existence and contemplating the futilily of life as I obstinately keep searching for meaning?” A more elegant way to convey the same thing: the waste of time. On the other hand, what if I actually enjoy that? What if I think that discussing in my head the nature of thinking and the possible consequences of things that I’ll probably never do is, for me, another manifestation of life? I know some people think that staying at home reading is not living life fully. Neither going to the park with your backpack full of books nor hoping for a rainy Sunday since it’s the perfect excuse to stay at home reading and writing and not looking like a dull creature surrounded by coffee and blueberry muffins that taste like heaven. However, the fact that one might be able to find enjoyment in such activities should be enough to avoid regret, right? No, regret is an inherent part of my nature and can’t be avoided by reading nor bungee jumping – it doesn’t matter the degree of passiveness or risk. I can’t relate to the meaning of your affirmation, which by the way brims over with prejudice. I may not be a fascinating riddle but you can’t know everything about me, pal. I’m aware of the passage of time on a level that could be considered almost unhealthy. Yeah, that’s how I live life. I hear ya. Although one might wonder, what the on earth is living life? Couch, rollercoaster? Cake or salad? Silence or crowds? Love or complete independence? All? Oh, jeez… none? Choosing nothing is still a choice. What kind of sick, little game is this? You’re writing and talking to the screen. You’re typing exactly what you’re thinking. I wish I could say that’s normal. You should leave this paragraph alone. Now. Thank you, I thought I was ready to grab a sword and become Highlander. I don’t think watching videos with cats sleeping or jumping like ninjas should be considered trivia. Neither it’s binge-watching series and sitcoms on Netflix. There’s a lot to learn, even from women who spent 15 years in a bunker. The last part sounds familiar; a constant source of disappointment. I think that’s all the help we can provide to the mortal who have the time to read this. This little chat in the form of a “review” has been pure joy and I’m sure you are now bursting with a contagious can-do spirit, feeling more positive than Enthusiastic Parker. Or maybe you’re looking at the ceiling, immobile, sensing the minutes that will never return, seeing life as a choice between a path that leads to an abyss and another path that leads to, well, another darker abyss – I bet Melodrama Cioran sounds like a peppy cheerleader to you now. Searching for meaning is philosophical suicide. How does anyone do anything when you understand the fleeting nature of existence? It wasn’t Camus or Sartre. It wasn’t a half-asleep Kierkegaard nor a drunk nihilist, but the point is still valid. You keep going, they said. You just keep writing. P.S. I feel awkward writing Holiday wishes after this little ode to the shortness of a meaningless life but still, Merry Christmas everyone. Note: Review written on Nov 2017.